ZIF5020 is a Z-Wave DIN-rail module with 10 digital ouputs and 4 digital inputs for mounting on standard M36 DIN rails (EN50022). The module is a general purpose Z-Wave I/O module that can be used for many different applications. ZIF5020 is a Z-Wave DIN-rail module with 10 digital ouputs and 4 digital inputs for mounting on standard M36 DIN rails (EN50022). The module is a general purpose Z-Wave I/O module that can be used for many different applications. ZIF5020 can be used as a Z-Wave interface to other home control systems and thereby making them able to be controlled from the Z-Wave network. The outputs of ZIF5020 are able to be connected directly to external relays (e.g. DIN-rail relay modules), as the outputs are internal equipped with freewheeling (flyback) diodes. Furthermore, are the outputs protected against overload, short circuit and overvoltage. 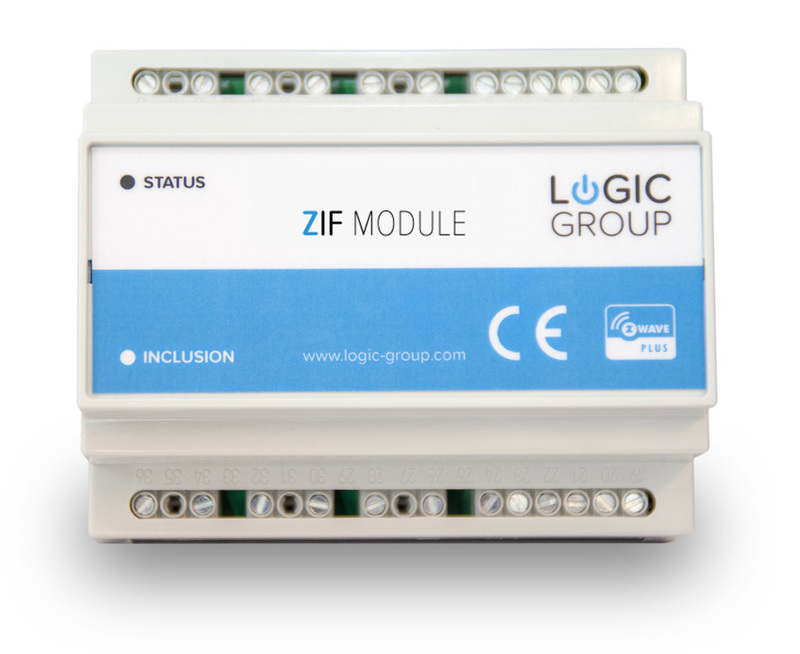 The ZIF5020 inputs can individually be configured to different trigger functions; leading edge, trailing edge or level trigged. ZIF5020 is based on Z-Wave Plus 500 series platform (awaits Z-Wave Plus certification). The firmware in ZIF5020 can be updated through the Z-Wave network (over-the-air, OTA firmware updates). ZIF5020 can act as a Scene Controller by transmitting different Scene Notifications, when the inputs are activated, long-activated and double-activated. ZIF5020 will act as a Z-Wave network repeater to increase reliability of the network.